A upgrade model from FJ-16 with automatic feed. Simple in design. Easy to opeate. Join stock as short as 4.5″. Capable of performing horizontal or vertical jointing up to 6″. * The above data are not binding to details as improvements are incorporated from time to time. * NOTE : ø50mm Clamping collars with various thickness for finger cutter are optional accessories to be ordered. * Additional units to expand the system are available upon request. * 1: The standard gluing device is roller type, the tenon depth is 12 mm. * 2: Inject type gluing system can be installed upon request. Table moving speed 3 ~ 4 carts/min. * All specifications, dimensions and design characteristics are subject to change without prior notice. • Trimming sawblade 2 pcs. • Hocking sawblade 2 pcs. • Scoring sawblade 3 pcs. • Cutter presetter 1 set. • Shaper cutter grinder. The initial infeed tables allow for continuous infeed of workpiece. The conveyor tables are raised by air cylinder. The pre-press assemble stand employs chain feed, and provides 3 and 6 meters of length to choose from. This assemble stand provides prepressed board ready to be cut to length, and ensures accurate vertical and horizontal alignment of finger joint. The pre-press is fully synchronized with cut to length process. The initial infeed table allows for continuous infeed of workpiece. The assemble press employs two hydraulic cylinder at front and rear, providing more powerful and faster jointing performance. This special design also assure extremely consistent jointing effect on the entire wood. The assemble press joints short stock to produce long board length up to 6800mm. A synchronized 2-step process allows the back of the press to continue jointing and cutting to length while the front of the press is performing pressing and outfeed motions. Times of cut are controlled by limit switches, which permits for maximum 4 times of cut setting. by one, eliminating operator’s efforts. Workpieces turn-over are made by a steel brush roller. Feed is driven by a servo motor. 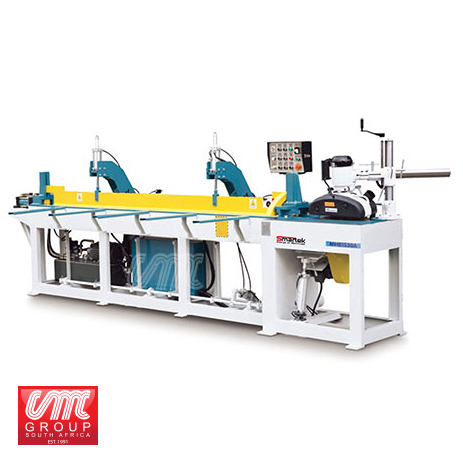 It combines three functions – scoring, trimming, shaping in a unit on right end of the workpiece. The table on the right and left finger shaper moves on precision linear gride ways for extra smooth movement. The trimming and scoring sawblade position are adjusted on the precision rod guides, which are hard chrome plated for maximum wear resistance. Micrometers are also provided for accurate indication for adjustment, ensuring superior jointing quality. The mechanism performs scoring, trimming, shaping operations on right end of the workpiece. Scoring blade in front of trimming blade cuts bottom edge to give tearing-free finish. Finger cutters produce smooth finger shape, cutting capacity 6 1/4″ thick. It combines four functions-trimming, scoring, shaping and gluing on left end of the workpiece. The mechanism performs scoring, trimming, shaping and gluing operation on left end of the workpiece. Scoring blades cut top and bottom edges to prevent fear-out. The feed system on the right and left finger shaper is driven by servo motor, providing high speed feed and increased efficiency. A cutter presetter is built on the right shaper for convenient cutter assembly. The mechanism performs scoring, trimming, shaping operations on right end of the workpiece. Scoring blade in front of trimming blade cuts bottom edge to give splinter free finish. Finger cutters produce smooth finger shape, cutting capacity 6 1/4″ thick. blades cut top and bottom edges to prevent fear-out. The assemble press joints short stoch to produce long board length up to 6200mm. A synchronized 2-step process allows the back of the press to continue jointing and cutting to length while the front of the press is performing pressing and autfeed motions. The three initial infeed tables allows for continuous infeed of workpiece. Located in front of prepress assemble stand this automatic feeding table allows workpieces to feed, on by one, eliminating operator’s efforts. Workpieces turn-over are made by a ateel brush roller.